Beautiful, bleak, mysterious and ancient, this is Dartmoor. A land of otters, poets, prison, ponies, Drakes Drum, modern firing ranges, and Uncle Tom Cobley of Widdicombe Fair fame - Yes the fair still exisits. 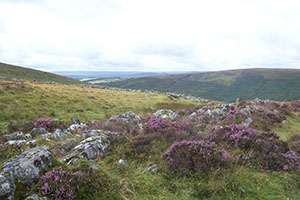 Wild and wonderful the moor lies in the south of Devon between Exeter Tavistock and Ivybridge in the south to Hatherleigh in the north. 365 square miles, one for every day of the year – except for Leap Year. The moor is named for its river - the Dart. The River Dart rises in two places, the East Dart to the west of Whitehorse Hill and the West Dart about a kilometre and a half north of Rough Tor. The East Dart flows south and southwest and runs through the little village of Postbridge. 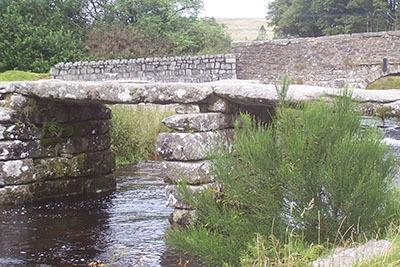 The medieval clapper bridge still exists here and is well preserved and complete. The two tributaries meet at the obviously named place – Dartmeet, in a steep and wooded valley. A medieval clapper bridge once existed here also, but it has collapsed now. The National Park's rugged open moorland and sheltered river valleys – leaves budding green in the spring, gold in the autumn and the stark bare branches of winter – all bid you explore. The moor is riddled with footpaths, riding trails and cycling possibilities. Long distance paths wend their way, some marked over the wild moorland. 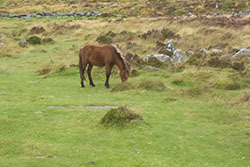 Dartmoor National Park Authority manage the area.Conservation of the moor is carried out by The Park Ranger Service. Conan Doyle's creepy story, “The Hound of the Baskerville's”, with the eerie yowl so favoured in films of the book was set in this bleak, mysterious, enigmatic world of Dartmoor. Perhaps that yowl is based on the myth of the spectral hounds or the one about the large 'black dog' that haunts the area. Misty - well foggy - and stormy, sunny and beautiful. Dartmoor is unpredictable and should be respected. If walking, cycling, or horse riding tell someone your route and expected time of arrival, just in case. If in a car and you run into fog, drive very carefully and stop where there is human habitation. Remember - sheep and ponies are not easily seen in a mist or fog. And they are as blind in a fog as you! Take great care in the high country in the northwest and south as they have the severest weather. If the area where you are planning to walk exceeds 1476 feet in height then check the weather before you leave. Always a good idea on Dartmoor anyway. If it is sunny or a windy don't forget the sun cream. Wind burn is as uncomfortable as sunburn! 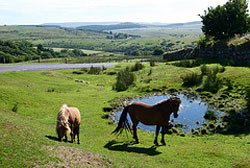 Dartmoor has seen many climate changes in its ancient history from volcanoes to the Ice Age. However once again climate change threatens as it does everywhere else in the world today. Within Dartmoor it is getting warmer and drier in summer and stormier in winter. Access to some parts of the Park are getting difficult with increased growth of bracken and gorse. Peat bogs are drying out and that too is causing concern. Is a registered charity, who carry out search and rescue work. These skilled volunteers are organised into four sections based on Plymouth Tavistock, Okehampton and Ashburton. Comforting knowledge if you get lost even though you have taken precautions. As a working animal they have been used by tin miners, quarry workers and farmers. Highly intelligent they needed little training as pack animals. The branded ones on the moor today are owned and protected by local farmers. Small, gentle and reliable, they are also bred as a riding pony and are ideal for children as a first pony. Don't try the wild ones! The Dartmoor Pony Society encourages the breeding of these delightful animals all over the world. Surprisingly this moorland pony is a rare breed today. Otters and Rivers, a Poet and Butterflies. “Tarka the Otter” by Henry Williamson is both a book and a film. A charming but sad story of an otter growing up in a river in Dartmoor, the otter family's persecution by hunters and Tarka's eventual heroic death at the hands of a large otter hound who dies with him. Timeless - this book was first published by G.P. Putnam & Sons in 1927. It has remained a firm favourite and can still be bought today. A movie of the book was made in 1979 with Peter Ustinov as the narrator. Williamson died before the film's completion, but his son and daughter in law appear in the film. Copies of the film on video are available. Tarka Country is the valleys of the Taw and the Torridge. Williamson used actual locations for his Tarka events and it lends credibility and emotion to the story. The Tarka Trail is a 180 mile figure of eight trail that follows the route taken by Tarka. It is a well marked trail and 30 miles of it is available to cyclists. Tarka's supposed birthplace was in the roots of an oak near Canal Bridge and this can be seen from the trail. Williamson lived and was buried in Georgeham in his beloved Dartmoor. “An otter” by Ted Hughes is a beautiful poem in which the cadence of the words seems to reflect the sinuous grace of an otter as it swims in the stream. Ted Hughes lived in North Tawton, near the river Taw and it his nature poems that are his legacy. One perhaps cannot help but think that just maybe Ted Hughes otter was another of the same family as Tarka. Romantic thoughts perhaps. There is a poetry trail in Stover Country Park dedicated to his poems. Takes about two hours to complete. Ted Hughes ashes are scattered on the moor he loved. Buckfast Butterflies and Dartmoor Otter Sanctuary is on the southern edge of Dartmoor at Buckfastleigh. A quite remarkable family day out. Take the South Devon Steam Railway from Totnes to Buckfastleigh. Two minutes from the station is the intriguing sanctuary. An added bonus is a discounted ticket available for the combined steam train ride and entry to the sanctuary. The ticket even includes re entry to the sanctuary if you wish to take a break and get refreshments. The resident otters have the best possible conditions for both their needs and viewing by the human species. The sanctuary breeds otters, many have been rescued others have been brought to the sanctuary because they are sick or old and need care. 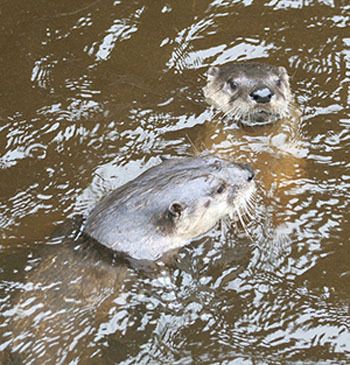 There are three species of otter, the very shy native British one like Tarka, cheeky Asian otters and North American River otters who play to the crowd. The exotic butterflies have a natural habitat of high temperature and humidity to sustain them and the plants and flowers they need. A colourful, vibrant, fluttering exhibition of butterflies, moths and plants to delight the senses. A beguiling insight into the world of these fascinating insects. All in all an extraordinary day out. People have been living on this amazing landscape since time immemorial – well at least 12,000 years it is said. Strange fingers of stone point skywards serving as a sentinel to the ancients, These standing stones and cairns dot the landscape all over the moor. Who knows what they mean, that they did mean something once upon a time is certain. Magic, mysterious names – Hunters Tor, a hill where it is said Roman Legionnaires fought the local tribes and now haunt the landscape. , and Roundypark Kistvaen which is just one of the cairns where they buried their dead, are some. The Neolithic folk who built those standing stones had become farmers unlike their hunter/gatherer forbears. They domesticated animals and grew crops. Being settled they built homes – round houses. During the Bronze Age most of the trees of Dartmoor had been cleared and the first fields were created by the building of long banks of stone. Thatched round huts were placed in the fields or in small enclosed villages. The people became skilled with metal, bronze of course, hence their name. There are more Bronze Age sites on Dartmoor than anywhere else in Britain. Being built of granite they have lasted the test of time and weathering. Many are protected sites. One of the most famous Bronze Age sites is Grimspound, close to Widdicombe-in-the-Moor. A pound was an enclosed Bronze Age village, this one has a massive granite wall. There are 24 round huts each built of two circular drystone walls with rubble infill. Sadly the acidity of the soil means there are few artefacts left. Climate change saw the abandonment of Dartmoor by most of its then population. It was not until the medieval period that the weather became warmer again and the people moved back. Some of their granite longhouses are still in use today, modified of course. Many are being used as farm buildings. Or you may wish to browse some more, please do, there are navigation buttons above on the left.